Unlimited snacks, wine and soda are included. If you are looking for a wonderful adventure then you will love this sunset cruise. It is perfect for you to have a romantic time with someone special as well. You will have a lot of fun and enjoy yourself. If you are looking for a romantic experience with that special someone then this is the chance of a lifetime for you. You will really have fun and enjoy yourself as you explore a place that is filled with rich history and culture it will be a magical place and you will really have fun there. You will enjoy free drinks and free snacks on your adventure as well. If you are looking to really enjoy Key West then this will be the perfect opportunity for you to enjoy. It is going to be a special time for you and you will create a lot of great memories. If you are looking for something special then you are at the right place as well. This is the perfect opportunity for you to relax and unwind after a long day. Key West offers the chance for you to really have fun and enjoy yourself and you will get to create a lot of memories as well. This will be something special and something for you to really enjoy. You'll enjoy your selection of domestic or imported beers and also lots of delicious snacks for you to enjoy. Come on out for the time of your life and the opportunity to create memories. This will be a fun and interesting time for you and you will not want to miss out on this romantic adventure that you can take with your special someone. Wind down your busy day with a relaxing cruise in Key West. Every evening, you can set sail, sit back and relax as your friendly crew pours you wines from around the world. If you prefer there is a selection of imported and domestic beers available. Sample up to eight (8) different wines. There will also be a selection of five (5) different beers available. To compliment the beverages, there will also be an array of cheese trays and appetizers including Havarti Dill, Smoke Gouda and Summer Sausage, Caprese Skewers, Water Crackers with Brie, Green Apple with a Honey Drizzle and more. 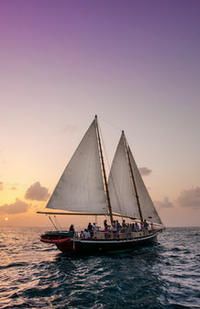 This upscale, relaxed and intimate cruise on a 65ft schooner is perfect for couples looking for a romantic evening or a fun group of friends. Enjoy a sunset sail like no other with fines wines from around the globe and hors d'oeuvres to compliment them. Great for that special occasion.